At 3 AM this morning we were all sitting around, giddily awake from our indignation over the fact that the top story on the ISM website was a travelogue called ‘the absurdity of feeding kittens in palestine’, written by newcomers, which detailed, among other things, how absurd it was that they hitched a ride from an Israeli settler- something one is never to do in ISM, not only because A.S.A.B. (all settlers are bastards), but also because were a Palestinian to see you in the car with a settler, they may think you are a spy, and it would ruin the trust and solidarity between Palestinians and that region in the entire ISM. How worse, then, for a story advertising such a fact to be given front page status on the website, where Palestinians all over the region, not to mention internationals all over the world, can see it! And how even more absurd that this is the case, when Gaza is under siege! Gaza is under siege, and when the international community comes to our website to learn about what is going on or what is to be done, they see that we are feeding kittens in Palestine, watching a camel be abused by Palestinians and crying, and hitching a ride from Israeli settlers! We had all just finished demanding that the article be removed, and writing an angry letter to the ISM core, when a twitter feed popped up on someone’s screen- 35 arrested in raids in Hebron, IDF soldiers storming the village. Instantly we called the Hebron ISM flat, woke them up and told them to get out there, though we heard the checkpoints were rapidly closing. The tension mounted- within minutes more feeds were popping up- 50 arrested, 60 arrested…when we heard, about half an hour later, that soldiers also appeared in Bethlehem, it dawned on us that we were witnessing a full-scale assault on the West Bank, and we called everyone in the ISM, woke them up, threw clothes on and got ready to leave to Hebron. If it was true that even 50 had been arrested in Hebron in the course of an hour before dawn, this would still be the largest such operation in 8 years. Since I am going to get my visa renewed in a week, it was decided that I should stay behind and be the media man, keeping everyone on the ground updated, because an arrest or detention could compromise my chances of getting a new visa. My friend Kyle and I sipped coffee as the sun rose, neurotically refreshing the Twitter pages, translating obscure posts in Arabic with Google translator, texting every bit of information we found to the folks on the ground- ‘soldiers outside information and service offices’; ‘soldiers in the towns of Doura, Beit Ola, Nouba, Yatta, Surif and Al Sammoa’;…reports kept surfacing that ‘Hebron, Bethlehem and Nablus’ were under siege, but we are in Nablus, and repeatedly walked out onto the roof to look on the ground for tanks or soldiers, and saw and heard nothing. Eventually the Nablus news was receded, probably a bit of gossip caused by collective hysteria and incessant re-tweeting. As the sun was rising, I went out to the roof, every little sound I heard made me jump; insecurity hung over the air, that this beautiful, peaceful mountain town would suddenly be pierced by screams or explosions. Just then, the call to prayer began to blare out of the loudspeaker below my roof, and its cry echoed through the mountains. I was overcome by what I heard in the singing- ‘do not worry; god will protect; this too has come already, this too shall pass, and we shall resist, and bear witness to the terror and the atrocities that are committed on this earth. though we are under siege, our people’s spirit is strong; fear not tanks, nor guns, nor war, remain strong through sorrow, firm your footsteps in this sorrowful world’. my bones shivered to hear such an emotion ring so palpably in the singer’s voice, and echo through the canyons. Just before dawn today, Sunday August 21, IDF forces raided the towns of Hebron and Bethlehem in the West Bank. So far, 120 people have been arrested in Hebron, including at least 70 Hamas leaders. According to the International Middle East Media Center, after midnight over 100 military vehicles and jeeps entered Hebron from 4 entrances, and raided 6 villages in addition to Hebron City, breaking into homes and occupying the streets, from which Palestinian security services were conspicuously absent. Israeli forces assaulted and detained a Palestinian man during a raid on the home of the Mufti of Bethlehem, in the refugee camp of Duheisha. So far, 2 Palestinians have been wounded by Israeli gunfire in Bethlehem. 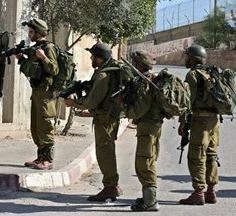 Though no statement has been released by Israel concerning the reason for the raids and arrests, they appear to be targeting Hamas leaders, presumably in retaliation for Hamas rocket attacks coming from Gaza in the last two days.A group of ISM activists stationed in Hebron have rushed to the scene, as have ISM activists in Nablus. As of now, mobile checkpoints have been set up around Ramallah and Jerusalem. Gaza was surprisingly quiet tonight, given that it is has been under seige for the last 3 days; apparently, the occupation forces spent the night gearing up to sweep through the West Bank. So far, Democracy Now and Al Jazeera have not reported these raids; the only major news outlet seems to be the small Ma’an News Agency. Needless to say, it is very, very exciting to be caught up in this whirlwind! It seems grim, however, as things look to be getting worse. As I said, an operation this large has not occurred in 8 years, and it has happened overnight, and still continues, and could accelerate in any direction throughout the West Bank. Israel is obviously showing off its might and cracking down, as a reaction against Thursday’s attacks, as a distraction from the social protests that threaten to turn the country upside down, and as a disturbing call to arms and national unity in the face of the UN Palestinian resolution set for late September.